Crawford graduated from Glasgow University in 1987. He spent several years as a Dental Officer in the Royal Navy including deployments to Northern Ireland, Norway and Iraq. 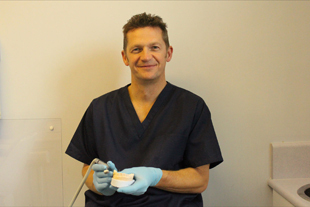 He has since had a committed career in general dental practice working in Glasgow and Edinburgh before buying the practice in North Berwick in 2000. He lives locally with his wife and two teenage sons. Crawford has always strived to treat his patients in a calm and relaxed atmosphere and his cheerful friendly manner has helped many a nervous patient to accept dental treatment without anxiety. He has a very active life outwith the surgery in which he tries to spend as much time outdoors as he can. His interests include sailing with East Lothian Yacht Club, skiing (alpine and touring), cycling (preferably downhill) and he has recently re awakened his interest in hockey and turns out for the Fidra Lions in North Berwick. Crawford has also managed to find time to gain postgraduate instruction in the provision of ‘Short Term Orthodontics’ (STO). This is the fitting of braces to correct squint or crooked teeth in a much shorter timeframe (typically 6 months) compared to traditional fixed braces. These braces can take the form of clear aligners or discreet tooth coloured brackets and wires. The system chosen by Crawford, after much research, is Quick Straight Teeth. Have a look at the orthodontic tab on the website for more information. Crawford completed his dental implant training at the renowned Scottish Centre for Excellence in Dentistry in Glasgow. If you would like more information on Short Term Orthodontics or Implant treatment, please contact Crawford at the practice or email him.